Greene's Across the Bridge (1957). Based on the short story (1938) by Graham Greene, Across the Bridge features Rod Steiger as an embezzling businessman who seeks to cover his tracks by assuming another man's identity. But as the other man is wanted himself, the businessman's situation becomes much more complicated. In April 1945, H. W. Wilson executive and mystery scholar Howard Haycraft reviewed The Father Brown Omnibus, a new collection of G. K. Chesterton's stories with the mild-mannered clerical sleuth. The review, which appeared in the 31 Aug. 1945 Palestine Post as "Chesterton Tales," discussed the genesis of Father Brown and addressed the question of whether these stories could be classified as detective stories because Father Brown's deductions are often intuitive rather than based on hard evidence. Haycraft's opinion was unequivocal: ". . .[A]t his best Chesterton is indisputably one of that small company of writers most responsible for the curious vitality and appeal of the detective story to modern readers, and Father Brown has been called the best loved of fictional sleuths after the immortal Holmes" (7). In Tread Softly, Stranger, two brothers (George Baker, Terence Morgan) vie for the affections of a gold digger (Diana Dors) and become involved in robbery and murder. The film is based on the play "Blind Alley" by British playwright Jack Popplewell. Carolyn Wells's "A Reader's Lament" (1899). Bulwer and Scott and Poe. And Crawford writes so fast. I've read the tales before. I can't name all the rest. Once more before I die. Jack Benny spoofs The Killers. Jack Benny and guest star Dan Duryea poked fun at Ernest Hemingway's "The Killers" in "Death across the Lunch Counter," part of the 4 December 1960 episode of The Jack Benny Program. Mabel Seeley's "What's in a Mystery?" (1940). The other night I met a very nice man who had just finished [The] Listening House. He looked me over rather cautiously, first from a distance and then a little closer and finally said, "Well, I wish I had seen you before I read that book—I wouldn't have been half so scared" (5). To Tell the Truth: John Creasey. Only one of the three guests on this 16 Sept. 1963 episode of To Tell the Truth is the real John Creasey, prolific British mystery author. 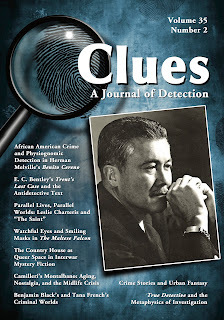 Clues 35.2 published: Bentley, Charteris, Christie, Hammett, Melville, et al. Clues 35.2 (2017) has been published; abstracts follow below. In addition to the print version (which can be ordered from McFarland), the issue is available on Kindle, Google Play, and Nook. The executive editor of Clues discusses the contents of the issue, including analyses of works by E. C. Bentley, Benjamin Black, Andrea Camilleri, Leslie Charteris, Agatha Christie, Tana French, Dashiell Hammett, and Herman Melville, and the TV series True Detective. This article considers the subversion of the analytical detective format in E. C. Bentley’s Trent's Last Case (1913). Exploring the text’s problematization of concepts such as logic and reason as well as its disruption of the detective’s ocularcentric interpretative framework, the author highlights the ways in which Trent’s Last Case unsettles delineations between the classic analytic detective story and the metaphysical or antidetective text. This article calls attention to the more than 250 references to eyes and their pervasive role in Dashiell Hammett’s The Maltese Falcon, arguing that the novel portrays a world in which trying to see past duplicity, dissimulation, and role playing of others, while seeking to hide one’s own, is pervasive. This article outlines some of the salient features and ad hoc history of metaphysical detective fiction (MPDF). Using True Detective season 1 as a case study, it explores how the series takes advantage of new programming freedoms to dramatize MPDF for a “broadcast literature” audience. This essay examines the recent success of Irish crime fiction through the works of Tana French and John Banville/Benjamin Black. Whereas the classic detective novel seeks to narrow multiple possibilities down to one determinate solution, French and Black resist this narrative pattern. In so doing, their novels both reclaim and reinvent the Irish literary tradition. Among the many unexplored areas of urban fantasy is its relation to crime fiction. This article explores how features of the crime story are used to emphasize, reinforce, or introduce urban fantasy’s social commentary. It looks at the genres’ relationship, analyzing three urban fantasies and their respective crime fiction elements. Salvo Montalbano, the protagonist of Andrea Camilleri’s detective series, goes through a midlife crisis that creates a biographical and ideological line of separation between the earlier and later novels, resulting in a new emphasis on the personal in the form of fleeting passionate engagements and less on social commitment. 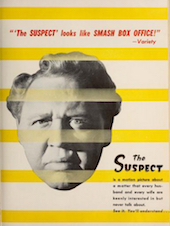 In The Suspect (1944), the life of a staid tobacconist (Charles Laughton) is upended when he befriends a young, unemployed woman (Ella Raines), resulting in murder and blackmail. Robert Siodmak (The Spiral Staircase, etc.) directs the film, which was adapted from the novel This Way Out by James Ronald. Priestley on "An Inspector Calls." Image of J. B. Priestley. NYPL. The British Library offers some resources on J. 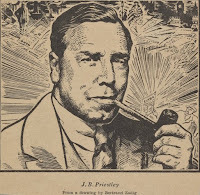 B. Priestley's play "An Inspector Calls," which writer Chris Power calls "a morality play disguised as a detective thriller" in an article on the BL Web site. In 1912, the mysterious Inspector Goole arrives at the home of a wealthy manufacturer, telling the complacent family members that he has questions for them about the suicide of one Eva Smith. The ensuing events alter their lives forever. 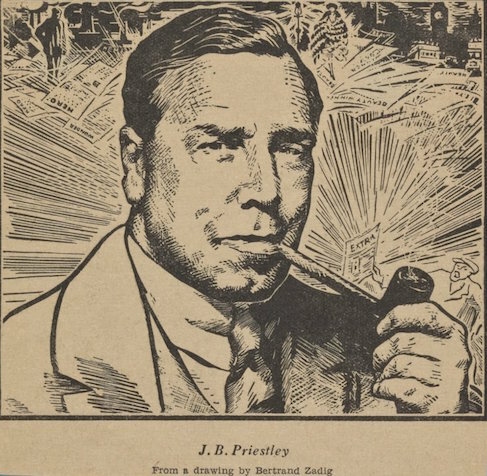 • The BL has a "Programme Note" written by Priestley in 1972–74. He explains that he wrote the play in 1944–45; comments on its numerous productions around the world; and mentions the odd fact that no matter the location of the particular production, the audience reaction "was almost always exactly the same." He also notes that the selection of the year of the play's action is significant. • Power's article discussing the play includes photos and reviews from the 1946 debut production with Ralph Richardson as Inspector Goole and Margaret Leighton as Sheila Birling.